"Hunter" and I went squirrel hunting in the snow over the weekend. He enjoyed it until it got to coming down hard and heavy. He's 100% full blooded "RUINED"!!! 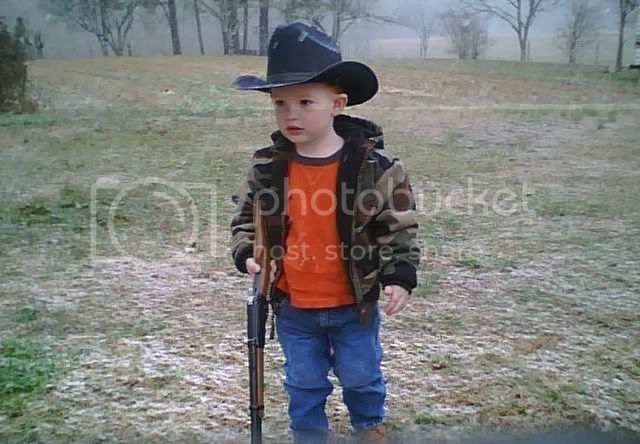 He's got a lever action cap gun that he calls his "fifle!" That right there is what its all about. You alt to have seen him running around in his cowboy hat with nothing on but a diaper. wow, what a cutie!! Great way to get him started! I'm right there with ya brother, my boy is 4 and has about the same gun collection, we bought him his lifetime hunting license before he turned 2, can't wait. Now,that is just way to cute. That pic. needs to be in an ad somewhere.